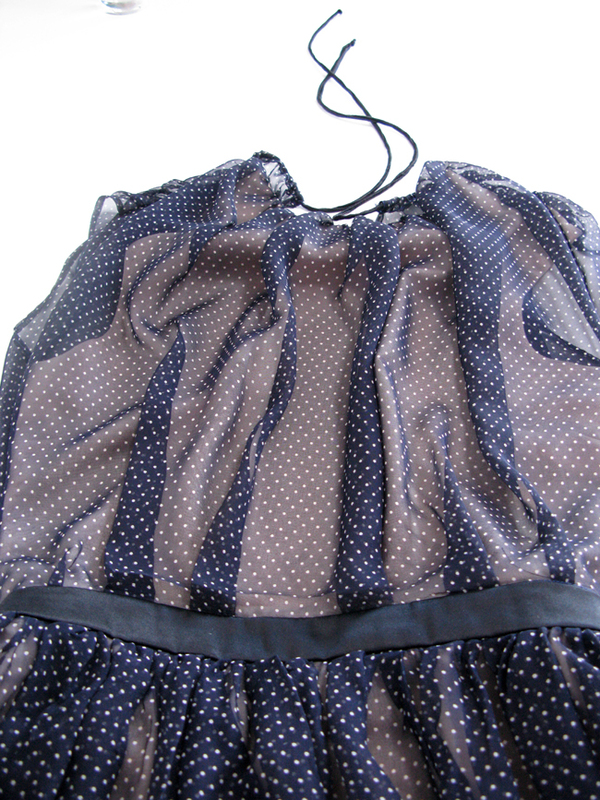 The brief was for a dress "suitable for a day event e.g. an outdoor wedding or day at the races." 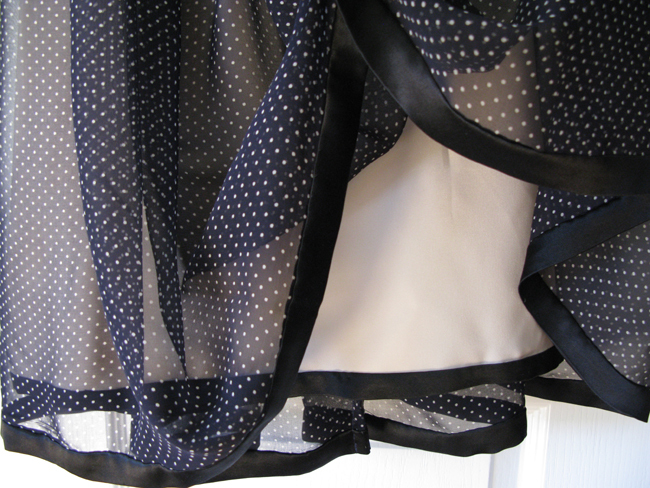 In the end I decided on a floaty silk georgette dress with matching black satin waistband and hem bands on the main fabric and lining - a nod to "stripes". My favourite suprise about the dress is the springy-ness that the satin band gives the skirt, sewn to the bottom of the georgette, and the sense of motion when the dress moves thanks to two black bands moving against eachother. 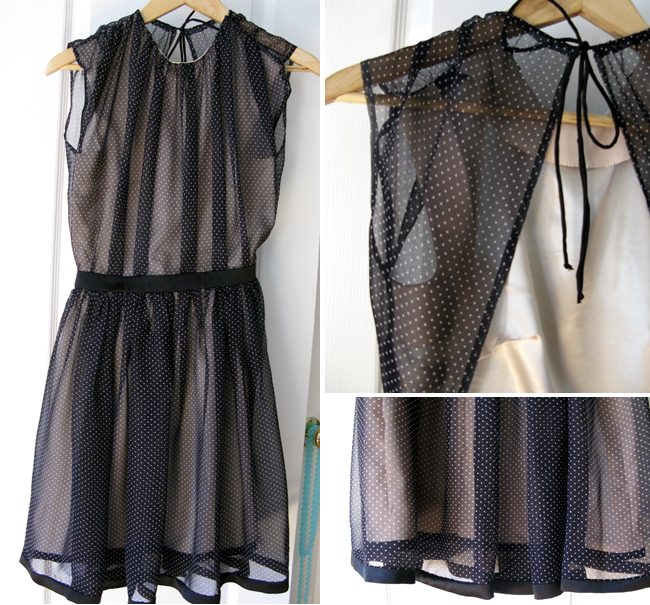 If I make this dress again, I might add a little more gathering to the top, or maybe a second layer of georgette. If you haven't already been to the website, there is an enormous amount of talent in this competition and it's so much fun to see how different people interpreted the theme. See for yourself, here. I'd love to know if there are more competitions like this out there, maybe you know of some? Have a great week-end, everyone! I LOVE this! It's so floaty, and the open back is completely unexpected! Beautiful! Thank you! And congratulations on the mood sewing network, really looking forward to following! It's lovely! Congrats! The open back is so beauuuuuuutiful. This is beautiful! I saw this briefly on the Burda FB site a few days ago, and just now I went on the Burda site to find it but I didnt know what it was called, so I did not know what I was looking for. Here I am. I love the pics, and other pic angles. Great Job. Im thinking of a beach wedding and your dress will be the biggest inspiration for my dress when the time comes. Thank you for sharing. Gosh thanks so much for your nice comment! Happy to share this idea- the beach wedding sounds dreamy, and imagining gathered ivory chiffon makes me want to do it over again too :) best of luck with your dress planning and have fun! This is truly spectacular - I love the ethereal-ness of it and the back is stunning. Such a beautiful dress! Also, I just discovered your blog via Burda - wonderful stuff! Hi Heather, thank you so much for your nice comment! I've just added your blog to me reading list and looking forward to reading. Love your style! comgrats on making the top 12! you really deserve it! what a fun dress, and i absolutely love the back. such a nice surprise! I voted for your a couple of times when I popped on! Good luck in the finals! Hello and thank you so much for your nice comment and for the votes too! I'm happy you stopped by - just added you to my blogroll and looking forward to following! Good luck with the wedding dress!